Outside it is cold and gray. I worry as we all slip and slide our way to the old school house from the parking lot. But we all made it safely this Friday and quite a group. In fact there were so many of us ready to sew that we set up a second quilt. A lovely one with bright floral pieces and small green diamonds that seems to laugh gently at the weather outside. Despite the weather there were other people stopping by as well. Bruce returned all our scissors that he had taken the week before to sharpen. Rick came by to look at the roof on the old school house as it will have to be replaced this spring. Melinda came in to meet the quilters and ask about bringing school children by some Friday. Darris dropped off cassette tapes of Tobacco Valley oral histories that Cathy will magically transform into mp3 format for him. A lady from Friends of the Shelter stopped by to pick up a quilt we donated for their annual fundraiser. Despite all this coming and going though, we still managed to quilt quite a lot. And of course laughed, heard stories, drank Joan’s coffee and had lunch. The quilting group is growing a bit. Dianne has joined us and Mary Jane has as well. Both are very good at sewing so they are a wonderful addition. When Melinda visited today, she pointed out that we could use some younger people in our group to pass on these traditions. Who wouldn’t agree with her but where does one get these younger people? I hear this lament often in town and I am not sure of the solution. Should we be inviting the scouts in? Arranging for the school to have credit for service learning? 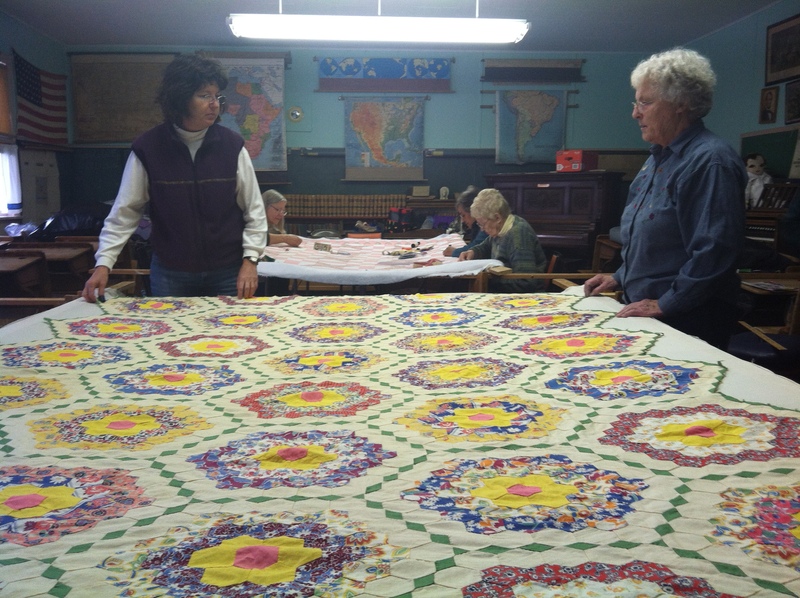 I am reminded of the concept of social capital but that is a fabric that is certainly more complex than our quilts.